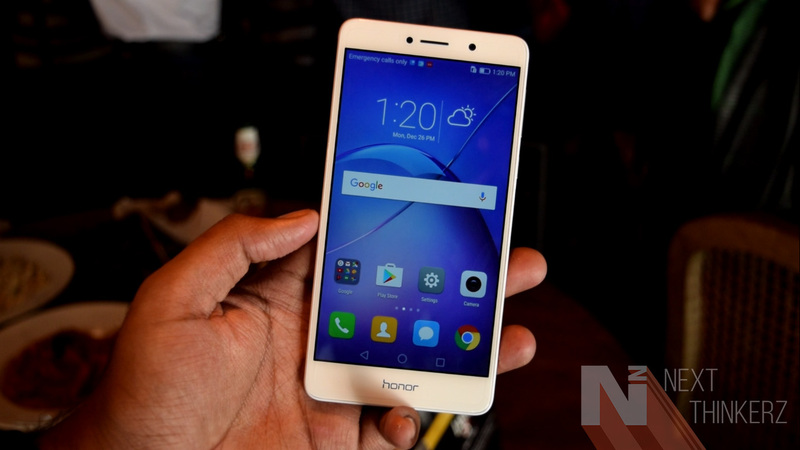 Honor 6X soon to be Launched In India: Specs, Price, and Availability[Accompanies Cheapest Dual Camera Lens]. For a while, the Company Huawei Honor has a been on a ride of announcing Dual Camera lens-centric smartphones. While if we speak about that, The Huawei P9, Honor 8 & Honor 8 smart has been a resemblance of how the cameras should be structured to obtain a well-constructed shot. So after the success of these smartphones, Huawei's Honor wants to extend their dual lens setup today in the mid-range market in India with their newest device, Honor 6X. Hence after having the taste of the Honor 6X for a while, It won't be wrong to judge that it stands as the best mid-range smartphone that offers excellent camera performance under Rs.15,000 price tag. It was launched a few months ago in China, due to which rumors got surrounded whether it would make it's debut in India soon enough. On the contrary, We were fortunate to get an early hands-on experience before it's actual official debut. 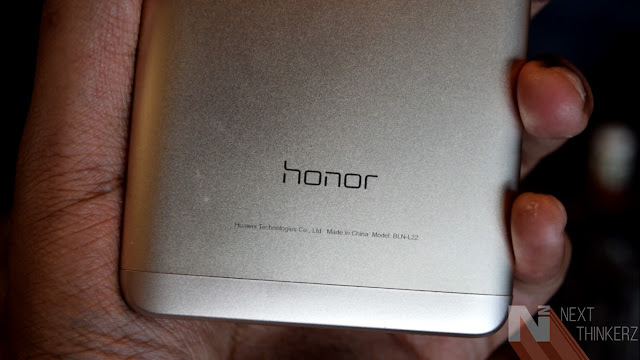 Therefore some of our words may vary with the final version of the Honor 6X. As today it has been officially announced globally, let's find out more about the Honor 6X with regards to its price, specs, and availability. Honor 6X soon to be Launched In India: Specs, Price, and Availability [Accompanies Cheapest Dual Camera Lens]. So the Honor 6X houses the Huawei's HiSilicon Kirin 655 Octacore chipset(16nm) which comes with a 64-bit architecture clocked at 2.1 GHz. On the graphics side, It has a Mali-T830 MP2 chipset. Speaking about the RAM, The Honor 6X differentiates in two models one that comes with 3GB housing a 32GB Internal Storage, While the second model comes with 4GB RAM and 64GB Internal Storage. The expansion is available on both of these via a MicroSD Memory Card Slot with up to 256GB. However, it'll only hit your spot if having a Hybrid SIM tray is fine on your end(1 SIM+Memory Card / 2 SIM+No memory card). As of the real world performance, I played with the Honor 6X for more than 2hours, and I didn't notice any hiccups. App load times were smooth enough, and even the multi-window mode was available on it despite the fact that it was running on Android Marshmallow 6.0, So that was interesting. Whereas the company also briefed us on the upcoming Nougat update hitting it & other devices later in the year. Finally talking about the battery it has got a 3340mAh Li-polymer non-removable battery onboard. While as a bonus, Fast charging has been incorporated into this device. Concerning the physical appeal, The Honor 6X sports an 8.2-mm thin body & has an overall large form factor, which amps up the weight to 162 grams. All that seems convincing as it has got a metal built, But to my liking, I didn't felt it hefty by any means. The Honor 6X has got a beautiful 5.5 inch IPS LCD panel which supports 1080p Full HD resolution maxing out to 401ppi. While speaking of beautiful things, It has a 2.5D curved display on the front which helps in providing a uniform shape on its entirety. However, there's no official word yet whether it has got any glass protection display on the front. The fingerprint scanner below the camera setup follows a similar footprint from it's elder brothers; It's not clickable, but the gestures have been implemented here. One of my most loved ones has to be swipe down to pull the notification shade. Also, it has got On-Screen buttons which are great, but the protruding chin and similar matching forehead make it look large. But hey, what can one ask more for such a pricing? If you're getting a well-equipped device regarding performance, Expect few comprises in little areas. The Camera segment is where the Honor 6X shines not because it houses a tag of affordable "Dual-Lens" setup being it's USP, But because it performs exceptionally well in real world. In fact, I can claim it right now that the sales for this device are going to be on fire. Speaking of the camera, the Honor 6X sports a dual lens setup with the first sensor being a 12MP unit, while the secondary being a 2MP unit. The design implementation on it keeps the camera module intact, though the camera setup bulges out. 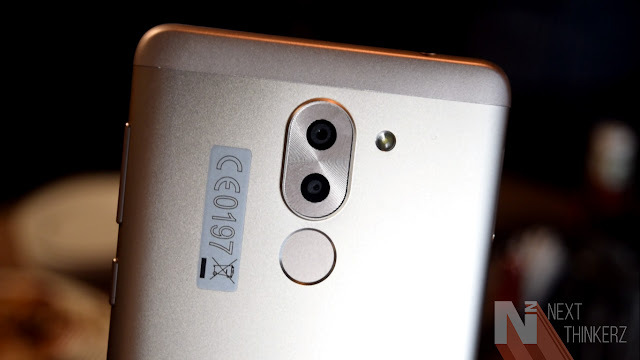 It has a glass construction built beside the dual lens setup, which signifies the term "More the light into the sensor better is the output." So speaking about implementation, The engineering team has done a great job. The rear setup takes Full HD 1080p videos at 30FPS which can be a shame considering the dual lens setup. But the absence of 4K won't be a regretting factor since the output quality of a 1080p video might serve your needs judging the quality, in my opinion, based upon my hands on usage. Besides that the lens blur mode works perfectly on the Honor 6X. There are several modes available on the default camera app including Manual Mode for Photos and a dedicated Manual Mode for Videos. Tough if you take HDR pictures there's some lag observed, Though that could get fixed in future software updates. We took several photos in extremely low lighting conditions, and the results were solidly appealing with proper contrast & deeper blacks. Whereas it also holds a LED flash beside the dual lens setup. Whereas if you're confused about the dual setup, It mimics the thought process of HTC's Dual camera implementation to create a depth of field. The 2MP sensor performs that task of a mapping the view and creating subtle blurs on the lens blue mode. If you switch the sides on the front, The Honor 6X has an 8MP Camera. 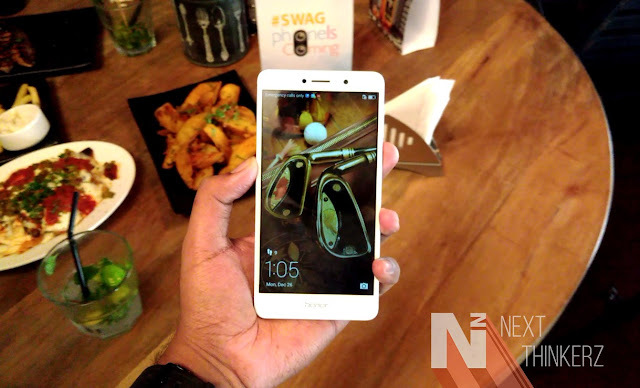 Again it does a job of taking significantly better photos than anyone else even under Rs.20000 segment. Sure there is a little bit of noise sometimes, But judging the quality and the fact that I took photos under low light, That impressed me a lot. The front camera has also got few modes up its sleeve. If I get a review unit, I'll explore more on this topic. 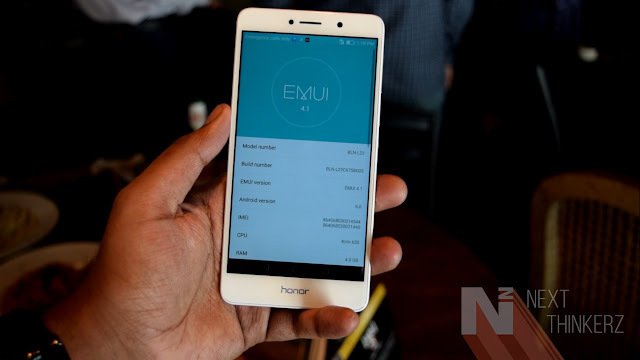 It runs on EMUI 4.1 build on top of Android Marshmallow 6.0 with Huawei honor's own flare of customizations. Their several signature fingerprint gestures and Multiwindow mode makes its way here. Whereas there's no App drawer found on EMUI 4.1 which is suitable to my liking, while Speaking about bloatware it's on the small side. HiSilicon Kirin 655 Octa-core chipset (2.1 GHz Cortex-A53 Quad Core & 1.7 GHz Cortex-A53 Quad Core). Mali T830MP2 with 3GB RAM (32GB Internal) & 4GB RAM (64GB Internal). Expansion is available up to 256GB(Hybrid SIM). 5.5 Inch Full HD IPS LCD Screen(2.5D curved glass, 401 PPI). Primary Camera: 12MP + 2MP Dual Lens Setup, shoots 1080p@30fps with LED Flash. 3340mAh li-polymer non-removable battery with fast charging support. Supports WiFi 802.11 b/g/n, Bluetooth 4.1 and comes with 4G VoLTE enabled. Dual SIM device(Nano Sims, Hybrid slot). Runs on Emotion UI 4.1 build on Android 6.0. Colors: Silver, gray, blue, rose gold. Well, I'll straight rest this judgement on my side as I've not used this device for an extended period. 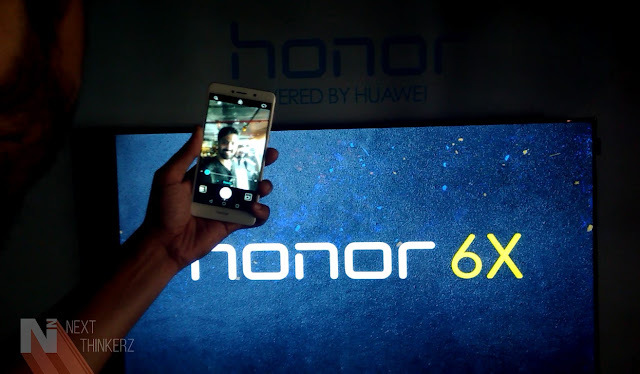 But for a while that I got to spent with the Honor 6X, It has excited me since I've used a couple of devices ranging under Rs.15000 while they've never hit the mark of calling them a perfect mid-range smartphone. But I guess with such a camera, robust software integrations & overall look and feel; It might be the next big thing in the mid-range market, in my opinion, hands down. So what do you guys think? Do you like it's camera performance? Let me know in the comments below.